Chicken is a popular dish in our home and I’m always looking for new ways to make it. I was watching Sandra Lee’s Semi-Homemade Cooking the other day when she prepared this dish. It looked simple and delicious and I decided to give it a try. One thing that intrigued me about this dish was that it was something I could throw together early in the day, refrigerate and then pop in the oven just before I was ready to start dinner. I love dishes like that! I followed the recipe except for one small change. Sandra’s recipe called for the addition of green beans. Since there are fewer people in the family that like green beans I opted to switch out the green beans for chopped fresh broccoli instead. It worked out perfectly. 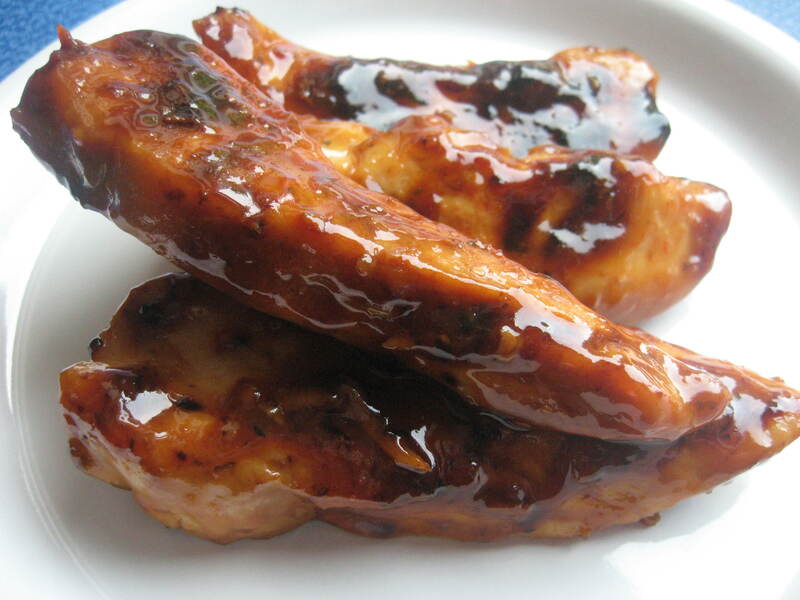 Trim chicken breasts of any fat. Lay flat on a cutting board and butterfly each breast 3/4 of the way through. Lay each chicken breast on a cutting board, cover with a piece of plastic wrap, and pound to 1/4″ thickness. Lay chicken breasts flat on a cutting board and sprinkle with seasoned salt and Italian seasoning. Place 3 to 4 strips each of the string beans, carrots and red pepper leaving 1/2-inch on the side furthest from you. Sprinkle each with 2 tablespoons cheese. 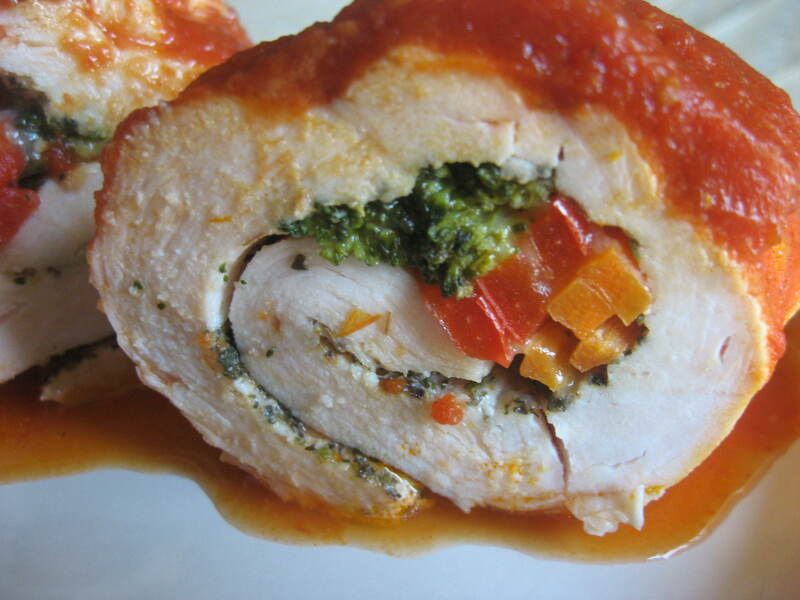 Roll chicken breast up and place seam side down in a medium baking dish. Pour marinara sauce over chicken and place in oven. Bake 30 minutes basting with the marinara sauce halfway through cooking. Remove breasts from pan. To serve slice each breast into 4 or 5 slices and fan on the plate with additional marinara sauce on the side. **Note: I did this early in the day, covered and refrigerated the dish, and then took it out when I was getting ready to start making dinner, preheated the oven and baked it. And additional note: this dish took just slightly over one hour to cook in a covered casserole dish, so I would adjust the cooking time from the original recipe provided. Sometimes I feel overwhelmed by all the fantastic food blogs on the web. So much talent and so many delicious ideas. There are some that I visit often, and the blog at Southern Plate has now become a fast favorite. If you are not familiar with this blog you need to visit it soon. It’s run by Christy Jordan the author of The Southern Plate. It’s a blog filled with great family recipes, followed up with some great family values and memories. The recipe I’m sharing with you today I saw at Christy’s blog and knew I had to try it. It has a total of four ingredients and just looked too simple to pass up. It’s easy and delicious and has quickly become a family favorite. There were no complaints on our dinner table the night I served this. You can find the recipe here . Christy calls these “Grilled Chicken Tenderloin – Without the Grilling.” My family refers to them as sticky chicken because that’s how they turn out. Deliciously sticky! This is a great meal for a hot summer night. I can see myself making extra and then using some sliced cold over some lettuce. Yum! Check out Christy’s site and some of her other fantastic recipes. You won’t be disappointed! I have made and eaten a number of different versions of Chicken and Rice. Some I’ve loved and some I’ve never made again. After trying so many different versions of this dish, I finally came up with a version of my own that I fell in love with and that my family enjoys as well. It’s a perfect dish to throw together when you are pressed for time, and is versatile enough that you can add anything else to it you may like. I’ve made it in both the oven as a casserole and in a slow cooker. Both turn out a great result. 3 lbs. Boneless, Skinless Chicken Breasts, cubed. Cut up chicken and place in a large bowl. 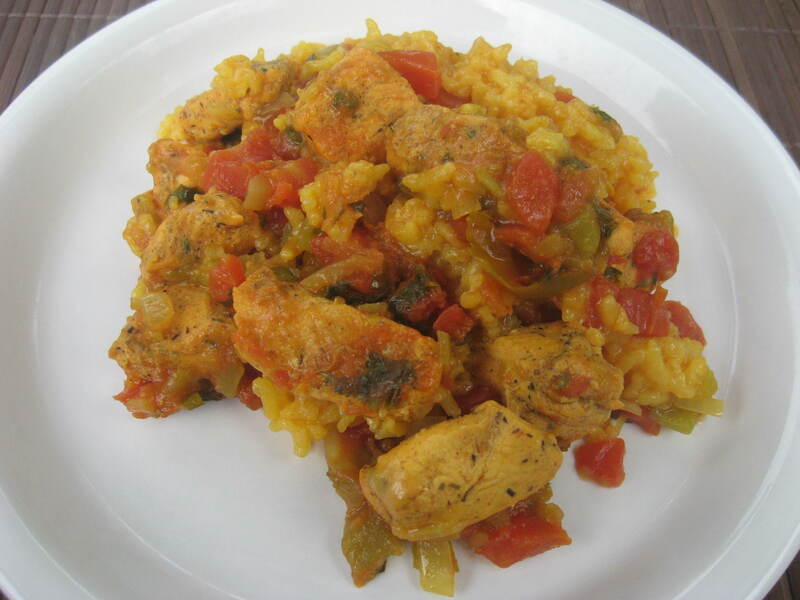 Add all dry ingredients, including 1 packet of the Goya Sazon to the chicken and stir well. Transfer to a Ziploc bag and refrigerate for a couple of hours, or overnight. When ready to assemble, remove chicken from the refrigerator. In a large sauté pan, add the butter and allow to melt. Add the chicken to the pan and allow to brown for a few minutes, stirring often so chicken does not burn. Once done, remove chicken to a clean and large mixing bowl. Add olive oil to the sauté pan along with the onion and garlic. Saute just until translucent. Add the onion, garlic, tomatoes, chilis, chicken broth, lime juice, cilantro, rice and the second packet of Goya Sazon to the bowl. Stir together well. If you are planning to cook this in the oven, add the mixture to a 13″ x 9″ greased baking dish. I just spray the baking dish with some butter flavored non-stick cooking spray. Cover with aluminum foil and bake in a 350 degree oven for 1 hour to 1 hour 10 minutes, or until rice is tender. If you prefer to make this in the slow cooker, follow the above instructions and add this to your slow cooker, set on low. Cook on low for 4 to 5 hours, or until the rice is tender. My children love taco night. When I say “taco” I mean the ones you buy in the box that have crispy and soft taco shells, a taco seasoning packet and some taco sauce. They don’t want adventurous fish or chicken taco’s. And that’s okay, because I can enjoy that ground meat mixture in a corn shell taco just as much as an elaborate one. 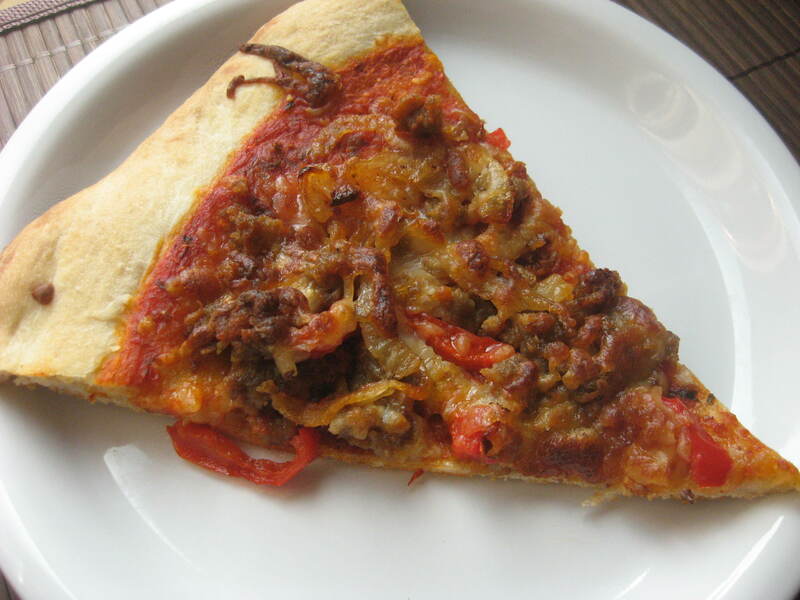 I ended up with leftover taco meat and toppings and decided to switch it up and throw it on top of some pizza dough. It made my children happy not once but twice this week when dinner was served. It also made my life a little easier knowing dinner would be quick and easy to throw together. 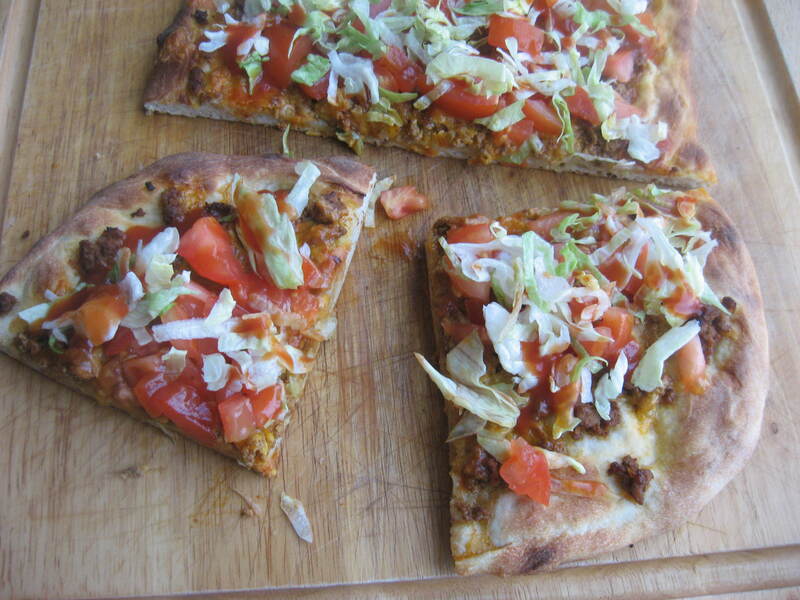 You don’t need to have leftovers from taco night to make this, you can just follow the basic recipe below and make the pizza by itself. Yum! Fresh Pizza Dough (either homemade or purchased) *please do not use the one in the can in the refrigerated section. Many grocery stores now sell fresh pizza dough if you don’t want to make your own. In a skillet, begin browning your meat. Drain of all fat, add the taco seasoning packet and the amount of water instructed on the packet. Stir together, remove from the heat and set to the side. Add a little olive oil to a sheet pan and some to the outside of the pizza dough. Work your dough into a rectangular shape on the baking sheet. If you use a pizza stone, which is an even better choice), work the dough out to fit the size stone you are using. I used a standard size sheet pan and worked my dough to fit the size of the pan. 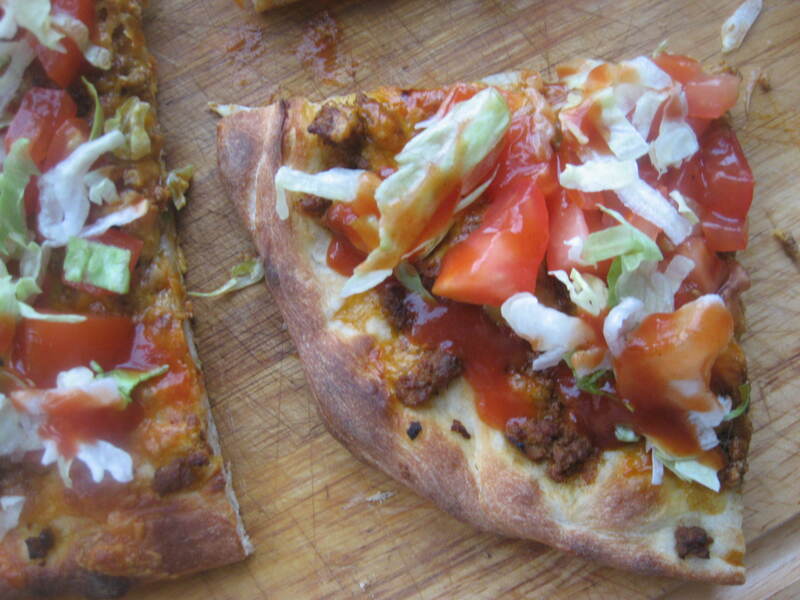 Using a slotted spoon, cover the top of the pizza dough with the ground meat mixture. Top that with the cheddar cheese. Place on the bottom rack of the oven and bake until the bottom is nice and crusty. If the top of the pizza dough is not browned enough, move it to the top rack and place it under the broiler for a minute or two to make it the color/crispness you are looking for. Be sure to watch it closely since it takes only seconds to burn! While the pizza is baking dice up your tomatoes and shred some lettuce. As soon as the pizza is done, remove the oven and place on a cutting board. Top with the tomatoes, lettuce and sprinkle with over some taco sauce, using just enough so that it doesn’t make it too soggy. You don’t want it dripping in the sauce! Add whatever other toppings you like such as sliced black olives, diced onion, avocado, cilantro, or sour cream.